Western blot analysis of extracts from human prostate and various cell lines using Arginase-2 Antibody. 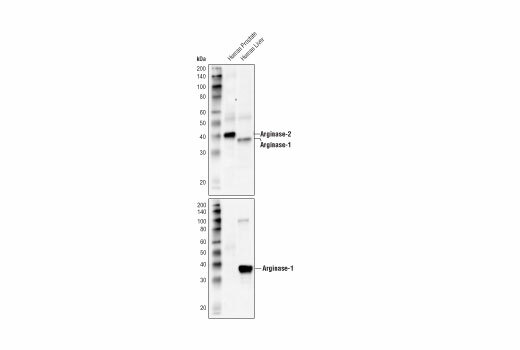 Western blot analysis of extracts from human prostate and human liver using Arginase-2 Antibody (upper) and Arginase-1 (D4E3M™) XP® Rabbit mAb #93668 (lower). Immunoprecipitation of arginase-2 from K-562 cell extracts. 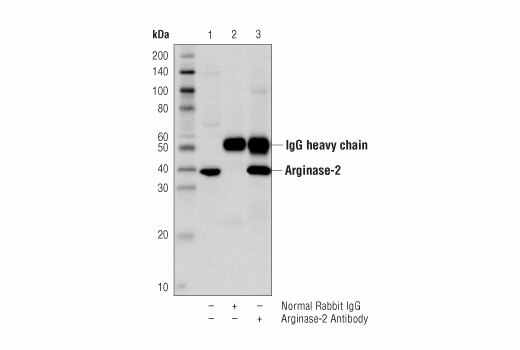 Lane 1 is 10% input, lane 2 is Normal Rabbit IgG #2729, and lane 3 is Arginase-2 Antibody. 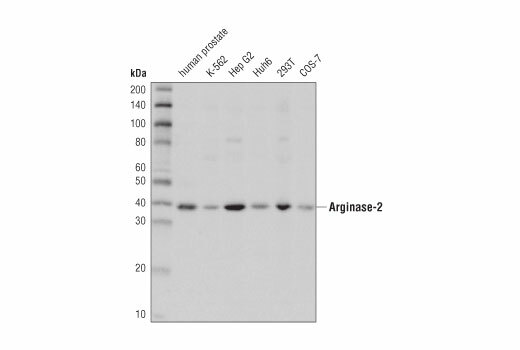 Western blot analysis was performed using Arginase-2 Antibody. Arginase-2 Antibody recognizes endogenous levels of total arginase-2 protein. This antibody cross-reacts with arginase-1 protein. Polyclonal antibodies are produced by immunizing animals with a synthetic peptide corresponding to residues surrounding Pro338 of human arginase-2 protein. Antibodies are purified by protein A and peptide affinity chromatography. D4E3M is a trademark of Cell Signaling Technology. Inc.